Witness the unique differences between our six Islands of Aloha by visiting these amazing geographic wonders. Known as the “Grand Canyon of the Pacific,” this dramatic, 3,500-foot deep canyon offers remarkable views. Located on the pristine North Shore, the towering cliffs of Napali are unforgettable. Hike along this scenic coast or explore the sea caves by zodiac. This state monument has become an iconic symbol of Hawaii. Hike to the top to see amazing views of Waikiki and east Oahu. This Marine Life Conservation District on the southeastern tip of the island is Oahu’s most popular snorkeling destination. 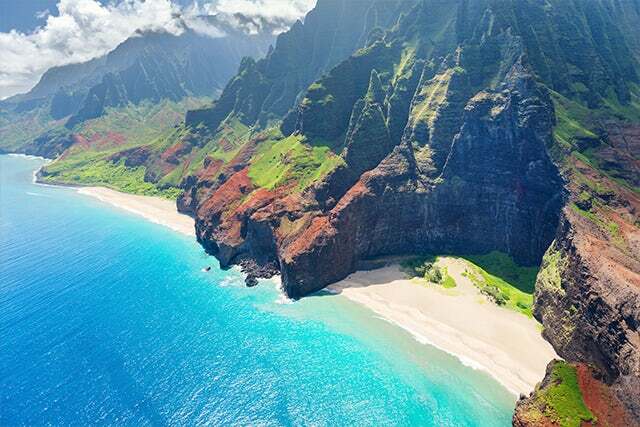 At three miles long, this secluded beach is one of the largest white sand beaches in Hawaii. Take a short hike from the Four Seasons Resort Lanai at Manele Bay to this iconic Lanai landmark springing from the sea between Manele Bay and Hulopoe Bay. The journey is the destination during this scenic (and notorious) drive to the peaceful town of Hana. Maui’s highest peak, at 10,023 feet, is the spot to see incredible sunrises and rare indigenous life like the Nene (Hawaiian Goose) and the silversword plant. Take a stargazing tour atop the largest sea mountain in the world, measuring over 33,000 feet from the ocean floor. Home to one of the world’s most active volcanoes, this park gives visitors the rare opportunity to witness new land forming right before them.